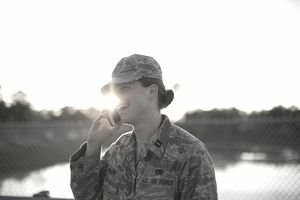 As an Air Force recruit, you'll get a chance to call home at least once during basic training, and depending on how you and the rest of your cohort (known as a "flight") perform, you may get additional call permissions as well. Your first call home is the only mandatory phone calls that training instructors (TI) are required to let recruits make. It will most likely happen on the first Saturday or Sunday afternoon after your arrival, but this is not a hard-and-fast rule. It's basically up to the TI. This will be a very short phone call, about three minutes, enough time to pass on your mailing information. Prepare your family or other loved ones in advance about this phone call, as you may not sound "well." This particular stage of training is stressful, both physically and psychologically, and your family members may pick up on this during the call. No matter how uneasy you might be feeling, it's best to try to remain calm when talking to your family. You won't really have time to tell them that you're OK; you'll have time to spit out your mailing address, then you have to give the phone to the next recruit in line. Make sure you and your family are braced for the experience. After the first mandatory phone call, how often you get to call home is a matter of privilege. The phones are located on the break patio of each dormitory. You earn patio breaks as a flight by keeping your TI happy. If your flight is doing well, your TI will give you more patio breaks. If your flight is not doing well, the TI may withhold patio breaks. TIs are given a lot of latitude in this area. Other than the first phone call, you will only be allowed to call home during authorized patio breaks. And needless to say, you won't have access to cell phones during most of boot camp. You may get lucky and your TI will give your flight a patio break when nobody else has one, or you may get to the patio and find out that every other TI in the building decided to give their flights a patio break at the same time. How long you will be able to chat on the phone depends on how long your patio break is, and how many other folks are waiting to use the phone. Lots of other anxious folks are going to be waiting in line to use the pay phones at the same time as you. Each dormitory building has only one patio, and several flights are housed in each building. Remember, these are pay phones, so bringing a prepaid phone card with you to basic training can speed things up. That way, you won't have to go through the operator to arrange for a collect call.